Christmas eve. For those of you in your late-twenties like me that usually involves one of two things: either stunted conversations in overcrowded pubs with old school mates you only see at Christmas, or awkwardly trying to avoid your mum asking you why, at 28, you've still not settled down and found 'The One'. All to a nauseating background of Slade and Mariah Carey. Well, this Christmas just gone, my mate Mike and I hatched a plan to spend the night in Robin Hood's Cave on Stanage Edge. Yes, the parents were inevitably disappointed and it would mean another year without catching up with schoolmates. Yet the idea of waking up on Christmas Day to mince pies, a view over Peakland and the sound of the wind howling around the crags was just too tempting to ignore. You can't totally escape the commercialisation of Christmas, and it would be rude not to, when the start of the walk is by a pub. 19:00 - after a quick pint in the cosy but quiet Fox House Inn (£3.95 for a pint of Moonshine? !- it is £3.20 in the Broadfield...) We set off up a deserted Burbage Valley under dark stormy skies and spits of rain*. Racing by torchlight against a weather front that was due to hit anytime soon, things suddenly felt quite surreal. Despite the Burbage Valley being effectively Sheffield's beautiful back garden (and just as busy), tonight it felt very isolated. We really should have been at home or in a pub with friends and family, full of festive cheer, not wandering into the hills with a storm coming in. The headlights of a distant car heading into Sheffield exacerbated this sense somewhat. We wanted a Christmas Eve with a difference, and different it was definitely going to be. After 90 minutes solid plodding we eventually arrived by the cliff above the cave. Relief. There was no sight or sound of anyone else in it. Our conversation could be as crude as we wished. Mike is a skinny Chezzy Whipper and wiggled down the chimney onto the halfway ledge and into the cave. 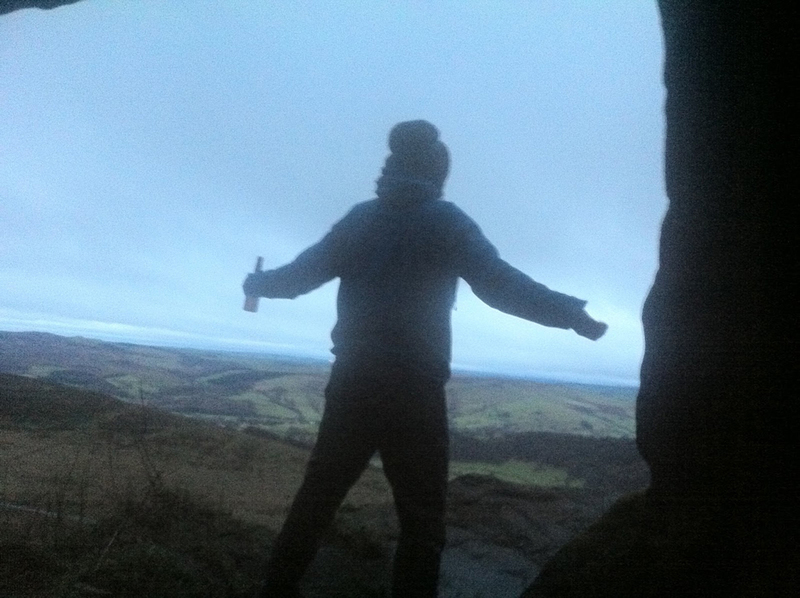 Having attended one too many hectic Christmas parties in the fortnight before, I had to walk down to the base of the crag and climb easily up the wet gritstone instead. Scramble out of the drizzle and gusty wind into the comfort of the cave. Sort out the bivvy bags and put warm layers on. Time to chill out. A rather pleasant evening proceeded; chatting nonsense and enjoying a shot or two of rum whilst gazing out of the cave. In the background, a few candles lit up its inner recesses. The forecast storm never materialised but the wind remained quite strong, sounding like endless waves crashing on the damp inky black cliffs surrounding us. Between the random conversation, thoughts wandered to the villages of the Derwent Valley below. They'd be full of hyper-excited kids, people all festive and cosy, and warm tasty food. Would we rather have been there? Nah. For once it was cool to look down on Christmas Eve like a passing satellite. Happily free from endless adverts, 'silly' jumpers and cheesy Christmas songs, we had a cool view out over Kinder, the place to ourselves and big dry cave to sleep in. Properly idle chilled-out good times. It was a pretty nice way to do it for a change. Christmas morning dawned, very mild and overcast. A very content hour was had. Down in the valleys people were in bed, eating chocolate or opening presents whilst we sat on the lip of the cave gorging on a breakfast of mince pies and beer. The land was awash with a nice peaceful ambience as the cloud gradually began to clear. Yet the belly wanted turkey, Yorkshire puddings and gravy, but the turkey, Yorkshire puddings and gravy were at home. Time to go. After a short abseil out of the cave we raced back to the Fox House Inn. There were a few people out for a pre-Christmas dinner potter and some climbers on Christmas Crack. Quiet, relaxed and happy, even if it was milder than a chicken korma out and about. 45 minutes later, the Fox House Inn and Mike's car appeared. It had been a cool little adventure leaving us well psyched to do something like it again this year. *A brief note on gear. For backpacking I use the Rohan Guardian Jacket as their Barricade membrane is more breathable than Gore-Tex, lasts a lot longer than eVent and unlike Paramo, won't leak when carrying heavy loads after several hours of rain. For one-night bivvy trips a stove is never taken. Just pre-make your meals so you can go lighter and spend more time chilling instead of faffing about trying to cook in a storm.